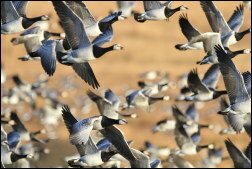 I couldn’t resist including a last photo of Barnacle Geese taking off from their feeding ground on Islay. One week is never long enough on Islay and now that we are back home I find that there are Waxwings all over the island. My favourite bird and I have missed them by a week – let’s hope they make their way down here to liven up our Winter. On Hopwood on the thirty first of October two Woodcock were resting, only a foot apart, at a place they always visit each Winter. If we have a severe Winter there may be a chance of baiting them with a regular supply of maggots. It is a great challenge and they are the only birds I have never filmed locally in Winter. Many long hours would have to be spent in a hide, entering it in the dark and hoping a bird would feed in front of it when it became light. I must admit I am not as enthusiastic about this challenge today as I would have been thirty years ago!. In the garden on the third of November we had twenty different species feeding for the first time since last Winter. There was a welcome return of a Song Thrush, Bullfinch and Starling and we await with anticipation for what the rest of Winter will bring.